Shareholder fees are paid directly by the investor when buying or selling shares. 12b-1 fees cover expenses for providing information to shareholders about their investments. Most of this information is now provided through e-mail or by publishing the information on the mutual fund's website. However, a major portion of the 12b-1 fee is to pay brokers and financial advisors for marketing the fund. Sales Load (aka front-end load) is the commission charged when the shares are purchased, to compensate brokers for selling the shares. Since front-end loads are subtracted from the purchase price, the actual investment is reduced by the amount of the front-end load, so a $10,000 payment to a fund with a 5% front-end load yields $10,000 – $500 = $9,500. Security rules limit front-end loads to 8.5% of the purchase price. Class A Shares charge a front-end sales load. Consequently, 12b-1 fees and annual expenses are lower than for other classes, which makes the shares a better deal for a long-term investor. Most funds also offer reduced front-end loads for investments greater than specific breakpoints established by the fund. Class B Shares charge a higher 12b-1 fee instead of a front load and a contingent deferred sales load (aka CDSC, CDSL , back-end load) as a commission to pay brokers who sell the shares. This fee steadily declines during a period of 6 to 8 years, after which it is eliminated and automatically converted to Class A shares with their lower 12b-1 fee and now back-end load. Hence, Class B shares would be a wise pick for an investor who is uncertain about her investment horizon. Class C Shares — Class C shares have no front load, but annually charge a percentage of assets that ranges from 0.75% - 1.00%. Class C shares never convert to another class. Furthermore, if the shares are redeemed within 1 year of purchase, a back-end load is charged, although it is typically lower than the back-end load for Class B shares. Hence, Class C shares would be the best buy for a short-term investor. A fund with a sales load will usually offer breakpoints in the sales load, where decreasing sales load ratios apply to larger purchases of Class A shares. Buying a number of shares that exceed a breakpoint will reduce the sales load percentage that would apply below the breakpoint. A fund does not have to offer breakpoints, but if they do, it must be disclosed in the prospectus. 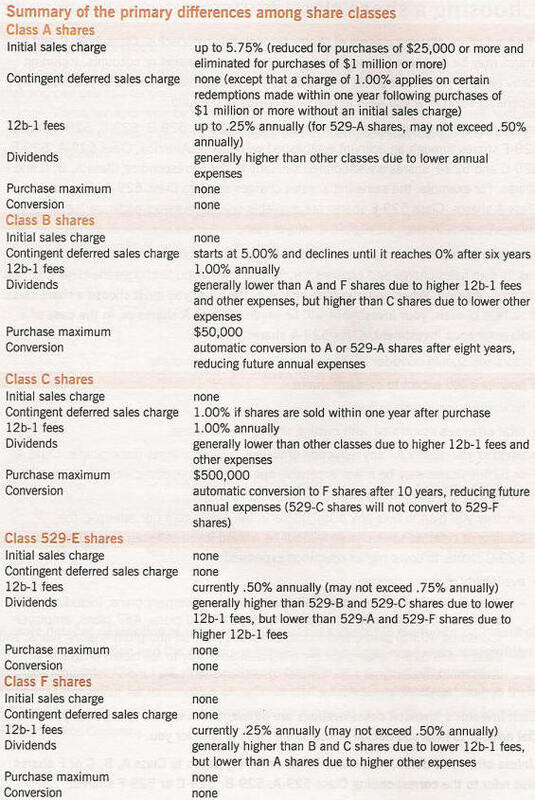 Although breakpoints apply to a one-time purchase of class A shares, 2 other ways that some funds allow to qualify for breakpoints over time are the Letter of Intent and Rights of Accumulation. An investor, lacking enough money to buy enough shares at one time to qualify for a breakpoint, can sign a letter of intent (LOI), stating his intentions to buy enough additional shares over the next 13 months to qualify for a specific breakpoint. By so doing, the investor benefits from an immediate reduction in the sales load, with more money invested for potential profits. If an investor has already bought shares within the past 90 days without signing an LOI, he can still reduce the sales charges already paid by backdating the LOI by 90 days, but, because the time span of a LOI cannot exceed 13 months, the investor must reach the breakpoint within the remaining term of 10 months. An LOI does not require the investor to reach the breakpoint, but if the investor fails to buy enough shares over the 13 month period, then some of his shares, which will have been escrowed by the custodian of his funds, will be liquidated to pay the higher sales load that would have applied without the LOI. To reach a breakpoint under the LOI, the total amount needed to reach the breakpoint must be actually invested—market appreciation of held shares does not count. An investor who does not have enough money to qualify for a breakpoint either by a one-time purchase or by signing a letter of intent may qualify for a breakpoint by buying enough shares over a long duration—rights of accumulation. There is no time limit. When the investor purchases more shares that, combined with what he has already invested, is enough to qualify for a breakpoint, then the investor pays the reduced sales load for those shares, but only on the shares just purchased. The reduced sales load does not apply to prior purchases. However, in contrast to the letter of intent qualification, rights of accumulation does take into account market appreciation. Thus, if an investor wanted to make another investment to qualify for a breakpoint at $20,000, and he has $10,000 invested, and $1,000 additional earned by market appreciation, if he had signed a letter of intent that covered the initial $10,000 purchase, he would have to invest an additional $10,000 plus fees to qualify for the reduced sales load, but he would get a reduced sales load on his entire investment. If he wanted to qualify through rights of accumulation with his purchase, he would only have to invest $9,000 plus fees, but the reduced sales load would only apply to the $9,000 purchase. 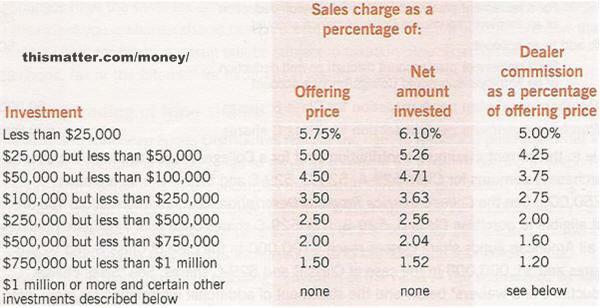 No load funds do not charge a front-end sales charge or a deferred sales charge, such as a CDSC. FINRA rules also require that the 12b-1 fees not exceed 0.25% of the fund's average annual net assets in order to call itself a no load fund. No load funds can, however, charge purchase, redemption, exchange, and account fees. A purchase fee is sometimes charged when shareholders buy shares that is paid to the fund—not to the broker—to defray some of the fund's costs associated with the purchase. A fee that is sometimes imposed if shareholders exchange their shares for shares of another fund within the same fund group or family of funds. An account fee is charged by some funds to investors who have low account balances to defray the cost of maintaining their accounts. Some funds charge a redemption fee when their shareholders sell or redeem shares to defray fund costs associated with redemption if the share were only held for a short time. Operating expenses do not include shareholder fees, and are paid out of fund assets rather than being billed directly to the shareholder. 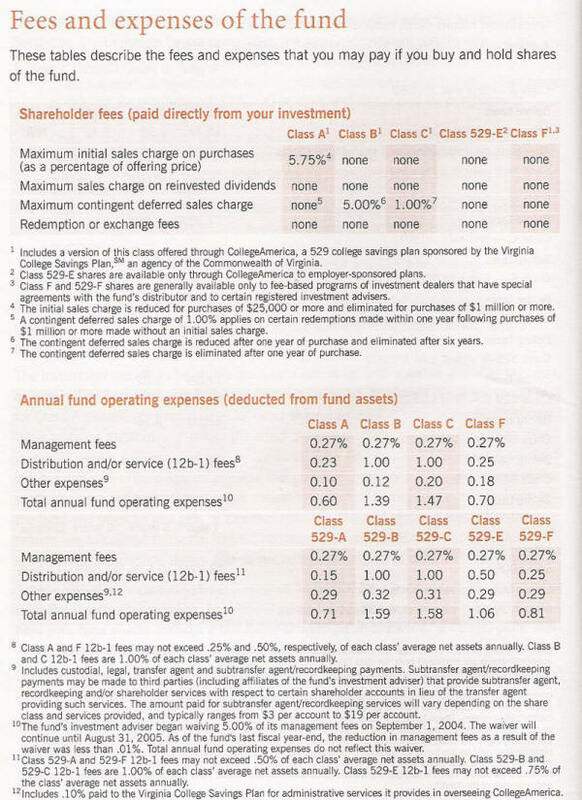 Paid out of the fund assets, management fees include payments to the investment adviser for portfolio management, any other management fees payable to the fund's investment adviser or its affiliates, and administrative fees payable to the investment adviser that are not included in other categories. Paid out of fund assets to cover the costs of marketing and selling fund shares to new investors, and sometimes to cover the costs of providing shareholder services. Distribution fees include fees to compensate brokers and others who sell fund shares and to pay for advertising, the printing and mailing of prospectuses to new investors, and the printing and mailing of sales literature. Includes all expenses not subsumed under another category, including custodial expenses, legal and accounting expenses, transfer agent expenses, and other administrative expenses. The expense ratio is an important metric when comparing funds, because it can make a significant difference over time. Any money paid for expenses is money that is not invested and earns no profit. High expenses are not proportional to better management. In fact, frequently, high-expense funds underperform index funds, which are minimally managed and have very low expense ratios. A fund's managers can become rich just by charging expenses even as the fund's NAV declines! Expenses included in the expense ratio, such as management fees and sales loads, are those such that if those expenses were reduced, then returns would increase proportionately. On the other hand, investment-related expenses, such as transaction costs, are generally excluded, since reducing those expenses will not necessarily increase returns, because such costs must be incurred to make investments or realize gains, or the cost is necessary to hold investments, such as the payment of dividends on a shorted stock. Consequently, different sources of information about funds may provide different expense ratios, because some sources only include those costs that are typically associated with the expense ratio, while others may also include investment-related expenses. Thus, there may be a wide discrepancy among reported expense ratios by different sources. The discrepancy will generally be greater for so-called alternative funds that engage in a significant amount of short selling, since the payment of dividends on shorted stocks may be a significant expense. Buy an index fund. Fund managers rarely do better consistently. Select an index fund with the lowest fees, since, if all other factors are equal, it will have the highest return among funds of the same index.